In Malaysia, the process of drawing or delineation of electoral constituencies is done by the Election Commission (EC) which is supposed to be independent and enjoy public confidence . The delineation of electoral constituencies is supposed to be in an equal and proportionate manner, where the number of voters in all of the electoral constituencies are almost the same. However, this is the opposite of what is happening in Malaysia, resulting in what we call ‘malapportionment’. Malapportionment simply means the unequal or uneven number of voters between one constituency and another constituency, which creates an uneven playing field for political parties in what should be clean and fair elections in accordance to international standards. Malapportionment makes it unfair for voters in larger constituencies, as their votes are not equal to those of smaller constituencies, as well as being unfair to political parties which contest in bigger constituencies. Another element to consider is gerrymandering, which is defined as the drawing of electoral constituencies to benefit one particular party, usually the ruling government. There have been long-standing allegations of gerrymandering occurring in Malaysia. As a result, we see the real life example of how non-Barisan Nasional (BN) parties have to work harder to win more votes to get one seat as compared to BN. In 1957 when Malaysia achieved its independence, the provision regarding delineation of electoral constituencies was fair in the sense that it allowed only a maximum variance of 15% for the size of an electoral constituency to the size of the average constituency of a particular state. The EC was independent in conducting its delineation process and was uninfluenced by the Prime Minister (PM) in the Dewan Rakyat in its process . This later drove the Alliance Government in 1960 to amend the Constitution to release the Chairman of the EC, but it failed. In 1962, the Constitution was amended to take away that safeguard and allow rural weightage to be changed so that urban constituencies can be double the size of the rural seat. The amendment also annulled the 1960 delineation retrospectively , and in effect the EC now has to submit its redelineation report to the PM for the Dewan Rakyat to approve, and the PM has the right to make necessary modifications. In 1973, the limit was removed altogether leaving no safeguard to the way electoral constituencies are delineated. This would result in the drawing of electoral boundaries at the discretion of the EC. In this case, a fully independent EC would not create any problems when drawing the electoral boundaries. The main concern is what happens when the EC is not independent and not impartial. In reality, the EC draws the electoral boundaries to benefit a certain political party to help them win more seats. This is, as earlier stated, gerrymandering. The current Federal Constitution provides for several principles for the delineation of electoral constituencies. Among many, the delineated constituency must not cross State boundaries, and State Constituencies must not cross Federal Constituencies , the presence of administrative facilities to facilitate registration and polling machines , equal number of electors in constituencies taking into account the difficulty of reaching electors in rural constituencies and the measuring of weightage to be given to such constituencies , and finally the inconvenience of attendants on the alteration of constituencies and the maintenance of local ties . Despite these principles, without the 15% safeguard as stipulated in the Merdeka Constitution these would seem useless as they serve only as guidelines and not rules for the EC in the delineation process. As such, we now see electoral boundaries drawn so unfairly and unequally, with seats like Putrajaya which have only approximately 15,800 voters amounting to one Parliamentary seat, while Kapar with 144,000 voters also forms one Parliamentary seat. So where does the one man, one vote and one value concept come in? Definitely not in Malaysia. The EC is empowered to make recommendations for constituencies delineation by informing the Speaker of the Dewan Rakyat and the PM and shall publish this in the Gazette and in at least one newspaper for the public to inspect . Any representation or objection with respect to the recommendation can be made within one month from date of the publication of such notice. The recommendation which is made by the EC can be objected by the State Government or local authority whose area is wholly or partly comprised in the constituencies affected  or by a hundred or more persons whose names are on the current electoral roll of the constituency in question . The EC must then conduct a local enquiry in those constituencies. Any objection or representation to the EC’s recommendation must be made within one month from the publication of the notice of the recommendation, in which case the EC shall publish again a notice on the revised original recommendation with the same requirements of the original publication . There shall be no more than two local inquiries held by the EC in the respective constituencies. After the completion of the procedure of the recommendation, the EC shall submit a report on the constituency showing that the constituencies they recommend that each unit of review should be divided in order to give effect to the principles set out in section 2  and the names by which they recommend that those constituencies shall be known . The report would be submitted to the PM to be presented to the Dewan Rakyat with a draft Order to be made. The draft Order must receive votes from more than one half of the total number of members of the Dewan Rakyat before the PM submits the draft order to the Yang Di-Pertuan Agong. His Majesty shall then make an Order based on the draft submitted to him by the PM and it will only come into effect after the next dissolution of Parliament or Assembly . In Malaysia, we practice the conventional First-Past-The-Post (FPTP) System where the winner of the highest number of votes wins the particular seat. In this system, it is paramount that the translation of votes into number of seats is fairly equated if not it would not only taint the election results but the whole process of democracy itself. The defect of this system in Malaysia is that it is always disproportionate, because the translation of votes to number of seats is uneven among political parties. The largest party wins more seats than the smaller parties although the votes received by the smaller parties are more than that of the largest. Hence it would be fair to say that the FPTP awards a more than proportional share of seats to the largest party and a less proportional share of seats to the other parties . The non-proportionality increases the share of the legislative majority of the governing party and creates a more stable and stronger government . Due to this disparity we now see the ruling coalition having 133 Parliament Seat with only 47% of the popular vote. Among this 133 seats, the 112 seats won by BN amounts to 2,189,599 votes which is 16.5% of the 13,268,200 votes cast nationwide . Despite all the freedom given to the EC to make the recommendations on delineation exercises, there still exist Constitutional safeguards in the form of a two-thirds majority vote required in Parliament to amend the number of Parliamentary seats in each States as well as amendment to State Constitution when State seats are concerned. However several proposals need to be made in order to improve the current delineation process. Firstly, let us look from the legislative perspective. We would need that very important Constitutional safeguard whereby constituency size in terms of number of voters cannot vary more than 15% from the average constituency in a particular State. To do so we would have to amend the Constitution to bring back that safeguard we once had in 1957 which is in the Merdeka Constitution. 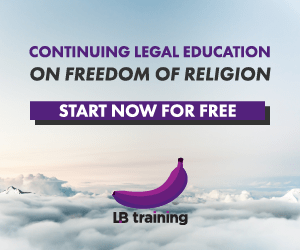 This requires legislative reforms in Parliament by bi-partisan support from both the ruling coalition as well as the opposition coalition to vote for that amendment bill. Only with a two-thirds majority vote from the Dewan Rakyat can the Constitutional amendment bill be put through. Besides that, the EC must be independent and free from interference from the PM or the Dewan Rakyat in its delineation process as provided in the Merdeka Constitution. Secondly, we would need to look at institutional reform in the EC. We all know that in order to play an effective role, the commissioners must truly be independent and impartial. They must not be affiliated with any political parties to ensure they are able to execute their duties without fear or favour. We have seen allegations that the Chairman and Deputy Chairman of the EC are also members of the United Malays National Organisation (UMNO) and the Chairman and his Deputy admitted that they could have been members of UMNO before but were inactive members . In order to ensure a truly independent commission, only commissioners who are not affiliated to any political parties should be allowed to be appointed hence it must be put into true effect Article 114(2), where election commissioners appointed enjoys public confidence. Only with a truly impartial EC can the Election Laws be properly enforced and most importantly the electoral constituencies can be fairly delineated. Thirdly, the Electoral Roll must also be clean and free from phantom voters. The courts must be able to review the Electoral Roll gazetted to ensure that phantom votes do not skew the election results like what happened in the Likas case . There must be no delineation exercise until the Electoral Roll is reformed to ensure clean and fair elections to be held. If the courts do not allow the review of the EC’s decision to gazette the Electoral Roll it would amount to the court condoning electoral fraud . Finally, the EC should look into other types of electoral system such as the Proportionate Representation (PR) system. Of course, a change in system comes together with its pros and cons. However, hybrid systems can be adopted by picking the good features of one particular system together with other good features from other systems. This new system would have to represent the will of the people in a proportionate manner with a balanced number of voters among constituencies. The lessons from the 13th General Elections should be a wake-up call for every one of us. Gerrymandering must be stopped at all costs in order to create an equal level playing field for all political parties. Also, the drawing of electoral boundaries to tip the scales in the favour of any party must be prevented in the future. The effect of unequal number of voters in constituencies does not only breach the equality clause in human rights but also creates an unfair situation — as if the votes of voters in smaller constituencies have more value than those from bigger constituencies. Therefore, it is paramount that the delineation in its effect must represent the will of the people in the form of equally represented constituencies to enable the proper translation of votes into number of seats for the political parties. The rakyat must always be aware of their rights and the current affairs of the country to discourage any hanky-panky from the authorities. As a final word, should any constituency redelineation be conducted prior to the aforementioned reforms there will definitely be a strong protest from the rakyat and that is a call the government should heed if it considers ours a modern, democratic society. Article 114 (2) of the Federal Constitution. Yong, Andrew (2013), Malapportionment & Gerrymandering — What Can We Do About It, LoyarBurok, pg 1. Yong, Andrew (2013), A History of Malapportionment: How BN can win 59.9% seats with 46.7% Votes, LoyarBurok, pg 1. Thirteenth Schedule Part I 2(a) of the Federal Constitution. Thirteenth Schedule Part II Procedure for Delimitation of Constituencies 4(a)(b). 2005 UK General election results. Hong Hai, Lim (2011), Reducing Unfairness in the Delineation of Electoral Constituencies, USM: Memorandum Submitted to the Parliamentary Select Committee on Electoral Reform. C.W. Lam (2013), Gerrymandering : We can do something about it!, The Rocket: Kuala Lumpur, September Issue. Successful challenge of the Electoral Roll in court which pended the Government to introduce Section 9A of the Election Act to oust the court’s jurisdiction to question the Electoral Roll once publish by the EC on the Government Gazette. Gurdial Singh Nijar, Chief Prosecutor of the Legal Team of the BERSIH’s People Tribunal. 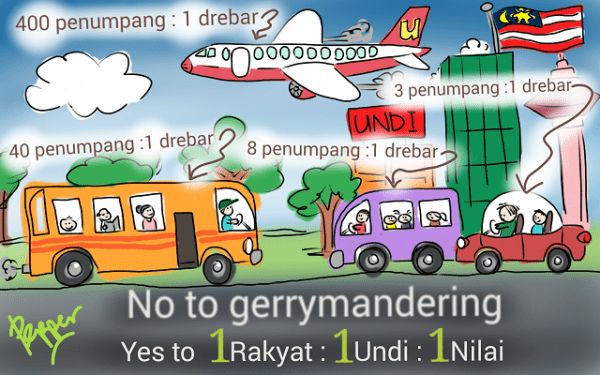 This article first appeared in daprocketeers’ blog, and is republished in conjunction with Sekolah Aktivisme’s Gerrymandering Awareness Week. For more information, please visit our website, or our facebook and twitter pages. Posted on 7 April 2014. You can follow any responses to this entry through the RSS 2.0.